Our researchers regularly give policy recommendations to the UN and its Member States — not just in emerging economies but also across Europe. In November 2018, Prof. Melissa Siegel spoke before the Second Chamber of the Dutch Parliament, where she briefed members on the migration situation, shared scenario planning for the future, and discussed various ways to help migrants and refugees integrate into society. What are the issues at stake – and who are the main stakeholders? I spoke in very close quarters with members of two committees: Migration and Security. This particular event was organised by both committees given their mutual interest on the topic. Broadly speaking, I discussed the outlook for refugees and development, and many MPs were interested both in what they can do in The Netherlands and what can be done in other countries. For some, it seemed, their goal was simply to stop more people from coming. I gave a projection into the future of what we can expect with regards to refugees globally. So I outlined some of the challenges we are facing. First, we have never seen the numbers we are seeing today and there is no indication that those numbers are going to decrease any time soon. Second, it is very unlikely that we’ll see high rates of refugees returning home. Third, the funding is quite stretched for international organisations and for countries dealing with refugees, which is a big issue. Fourth, there is a large number of refugees in protracted situations (meaning five or more years); but we are also seeing people displaced for over 20 years. For example in the Dadaab Refugee Complex in Kenya which is one of the largest in the world, you now have third generation being born there with no prospects for change. This situation is not good for the refugees themselves, the country of destination, or the country of origin. Overall we need to get out of the mindset that refugees are a short-term problem and that they simply require humanitarian assistance. This is not to say that aid is not fundamental; however, we need to start thinking about long-term solutions. What can be done to ease the situation? I discussed some of what I see as the preconditions for the development of refugees. These revolve around the issues of rights and access. For instance, people need to have freedom of movement as opposed to being stuck in camps, which is problematic for almost everyone concerned. They need to have access to healthcare, education and social protection. Finally, refugees need to gain legal rights, enjoy legal integration, which means moving from refugee status to citizenship. How can we ensure EU governments protect the rights of refugees? It all boils down to resources. A lot of countries simply cannot afford, in terms of manpower or infrastructure, to house these people properly – but that is where other European countries can help. Basically, though, we need to get refugees out of their encampment situation. This in turn requires a more profound discussion regarding relocation to other parts of Europe. The relocation processes which have been suggested take into account the preferences of the refugees, particularly if they have family and friends in a particular area, which would naturally become their support network. The idea is to find a balance which ensures that both the host societies and the migrants themselves benefit from this framework. What did you learn from the Dutch Parliamentarians? I observed a wide spectrum of ways of seeing refugees: from trying to give the best services possible and giving people an opportunity all the way to people asking ‘how can we make them go back?’ (which perhaps reflects some of the sentiment of the local populace). I also saw a lot of people who were really engaged and interested – people who wanted to learn from across the political spectrum. MPs were open to understanding the facts and exploring what solutions there might be. I really appreciated their willingness to think the issues through. What impact will your recommendations have? That’s a very difficult question. It is unclear what the MPs will do with the information I provided and indeed what are they will be able to do politically. 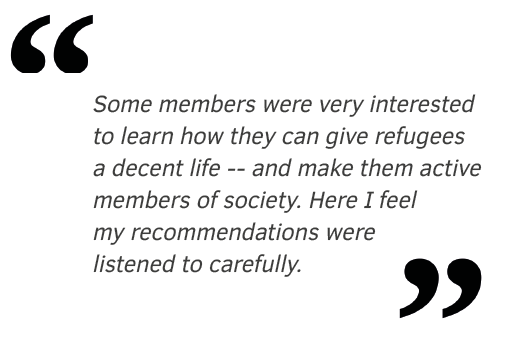 Some members were very interested to learn how they can give refugees a decent life — and make them active members of society. Here I feel my recommendations were listened to carefully. With regards to some policies this simply means ensuring that the measures already in place are implemented better. In other cases we talked about new policies and new thinking. We talked a lot about how we can integrate migrants better in terms of making sure they don’t have to pay for their integration themselves. For example, language courses should be free or virtually free, as in countries like Germany. This would make them feel welcome and give them an incentive to integrate more. I think overall we need to create an enabling and accommodating environment. We need to help people to help themselves, so that they’re able to integrate.